Adi Shankaracharya was born as Shankara in around 788 AD in a Brahmin family in Kaladi village of Kerala. He was born to Sivaguru and Aryamba a number of years after their marriage. It is said that Aryamba had a vision of Lord Shiva, in which he promised her that He would incarnate Himself in the form of her first-born child. The life history of Adi Shankracharya tells us that he showed great intelligence right from his childhood. He mastered all the Vedas and the Vedanta in gurukul itself and could recite the epics and Puranas by heart. His father died while Shankara was very young. Shankara's upanayanaṃ, the initiation into student-life, was performed at the age of five. 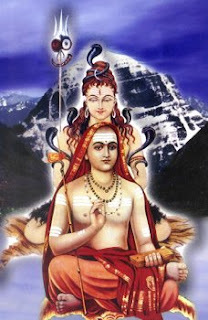 As a child, Shankara showed remarkable scholarship, mastering the four Vedas by the age of eight.